Climate Common Sense: Big Brother claims Orwellian status! 1) Questioning the role of greenhouse gases as drivers of climate. 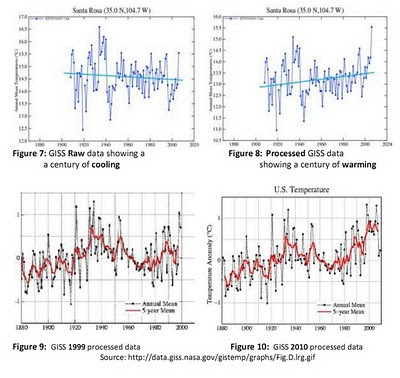 Skeptics do not generally disagree with greenhouse gases causing some warming. They just don't believe in the crackpot theory of positive feedback causing dangerous warming . 2) Invoking a plethora of unsupported alternative mechanisms such as solar radiation, cosmic rays, water vapour, Mars and Venus warming, volcanic emissions and geothermal heating, to name but a few. It should be obvious to anyone with any practical knowledge that some of the above would have some bearing on the climate . The recent CERN experiments have brought cosmic rays dead centre into the equation and any real scientist would be heavily investigating this new evidence instead of writing this crap. 3) Negating empirical scientific measurements by misciting the literature and propagating unreferenced plots from unknown sources. 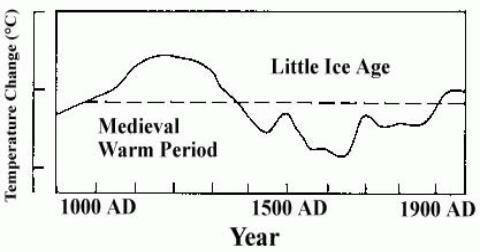 An example is the exaggeration of the Medieval Warm Period, which reached less than 25% of 21st century warming. 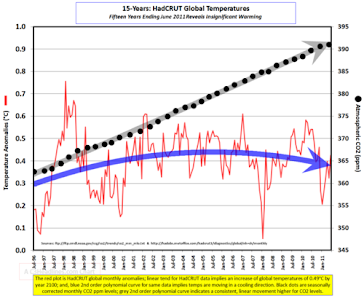 The MWP evidence he says was miscited was in the original IPCC reports and when it was realised that it contradicted the " unprecedenting Warming" gospel one Mann of the Team was given the Winston Smith task of altering the history to erase what was previously a commonly accepted fact . Inconvenient MWP diagram from the 1990 IPCC Report . 4) Avoiding, misrepresenting or attacking the bulk of the peer-reviewed literature (only a very small minority of papers question anthropogenic global warming). 5)Claiming scientists are working together in some imagined climate change conspiracy. It is almost impossible to get a heretical peer-reviewed paper published and the Climategate emails show the lengths to which the high priests will go to prevent publication, even getting editors fired. The big problem for the warmist faith is that where poor old Martin Luther had to nail his heretical views to a door, skeptics now have the blogosphere to instantly provide real global review of dodgy papers from so-called climate scientists. Climategate sank Copenhagen and will eventually sink the Global Warming Church because the so-called scientists who peddle this particular snake oil have lost the trust of the people . 6) Employing a plethora of websites containing recycled, long-discarded arguments. How the raw temperature has been tortured until it confessed that global warming was happening. How you can you can balance a dodgy heat balance equation by assuming the errant heat is "hiding "
under the bed, in the deepest ocean or somewhere and still call it "science"
How it is actually warming like crazy except the warming is also" hidden "by cooling! You might be detecting a "hidden' pattern here. How every alarmist paper starts with the result that CO2 is the culprit and works back from that result to the investigation of the pet topic that is getting the big government grants. How to create a scary graph you can tack together dissimilar graphs to hide faulty data even though real scientists are not allowed to do that. How recent harsh Northern winters and record snow-falls in Europe and America are caused by warming. Warming causing freezing definitely sounds Orwellian. .
How Australia's droughts were caused by global warming which also caused the heavy drought breaking rains . 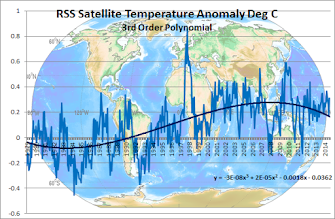 Warm/cold and wet/dry all caused by global warming. However the only real Orwellian re-writing of history has been by those promoting the global warming scam typified by the erasure of the MWP and the Ministry of Truth aka NASA realising that adjusted historical data could support the fraud and making the adjustments in the past where no one would notice . Same data before and after adjustment. The past changes before our eyes - a miracle from the Great God of Warming! If all climate scientists quit playing with their hopeless computer models and actually got real productive jobs I wonder how long it would be before anyone would notice? I also wonder what is the percentage of climate scientists on the public teat compared to those with private employ. Maybe it would reach the magic 97% mark with its climate scam significance.